‘The Seven Steps is a unique system that chunks writing into seven main techniques. The chunking concept is modelled on the way we learn sport. Take tennis for instance. First we learn the individual skills – forehand, backhand, serve, volley and smash. Then we practise the skills over and over until they go into ‘muscle memory’. Finally we put the skills together to play a game. Yet in schools we often ask students to ‘write a story’ – in other words play the whole ‘tennis match’. Hence they struggle. 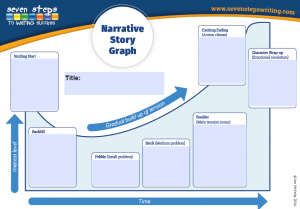 Have a look at the completed narrative story graphs. Now see if you can map BFG as a class on the story graph.